A day when the post office and banks are closed always feels like a free day. There isn't any business you can take care of. Now on day 2 of 2013 it is time to get back into routines. Yesterday on my free day I wound bobbins. One spool the size and brand that is in the photo filled 15 and a third bobbins. I don't get irritated when a bobbin runs out if I have a new one ready to pop in. I found another box of Kaffe scraps, mostly strips so I sorted them into piles of different lengths and then returned them to the box. I watched season 1 episodes of Downton Abbey while in the studio. It doesn't look like Netfix has the second season available so I'll be searching other places for it today. I also quilted a bunch of the mug rugs while I was glued to the TV. This one is ditch quilted. 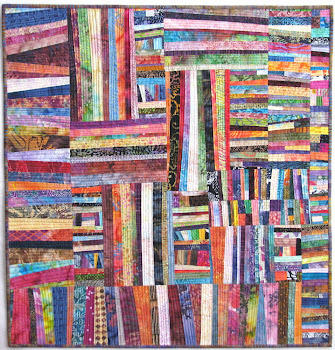 I grid quilted this one and it ended up being my least favorite style of quilting. I did a square spiral on one of them with random spacing between the lines of stitching. My favorite style ended up being the random straight lines like I did on the last 3 table runners. I have 3 more to quilt and then I need to look for bindings. I took this photo of the Amaryllis on Dec. 30. 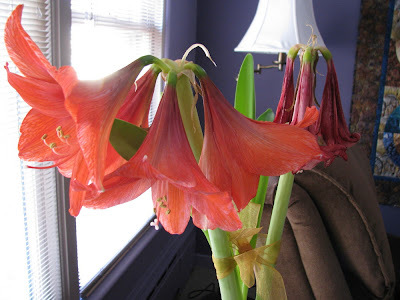 It is about ready to have the flower stalks cut off now and I'll retire it to my heated garage. It is about 60 degrees out there so it should be OK.
Today I need to get a couple backings sewn together and get a quilt loaded on my longarm machine. Time to get to work! 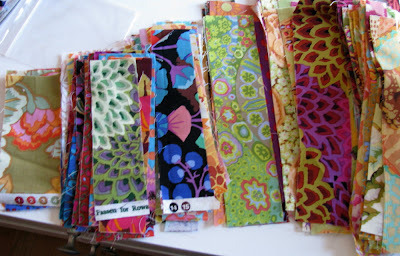 So, the scraps really do multiply when you're not looking! I kind of like the square spiral one better. Happy New Year, Wanda! Happy New Year! Yes, back to business as usual. I am back to teaching online tomorrow and am going to miss my free time. I am also watching Downton Abbey and love the characters and setting. We don't seem to have good shows like that in America. I bought the first season from Amazon to watch on my computer. The second season is available on Amazon for $14.99. I have never just wound a whole spool of thread onto bobbins. I usually do 4 or 5 at a time. I may have to try doing a spool of thread for bobbins. 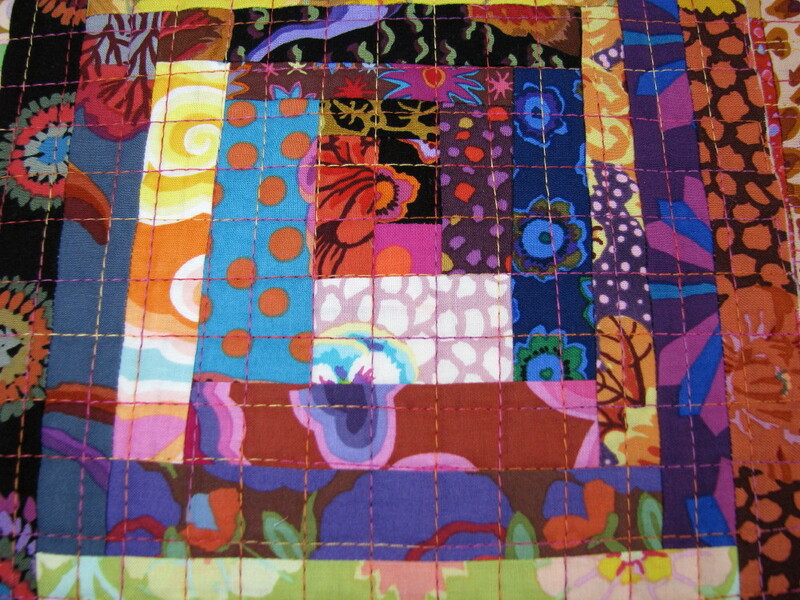 I like the random lines best too - and I find it the easiest quilting even if it is not the most exciting process. I use the walking foot when I do it this way. 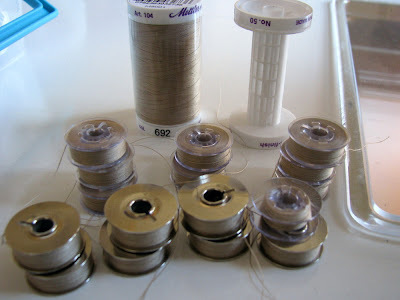 Great tip about the bobbins....I keep a full box of them wound in my basic colors, too. Filling a lot at once is a great tip that others should try. looks like you got done with a bit. I never think to do a lot of bobbins at one time. Normally before a project I might do 2 bobbins but that is about it - you got a lot of mug rugs done. Happy New Year! I like the idea of preparing so many bobbins at once. I'm going to try that. I'm pretty sure you can watch the second season of Downton Abbey on Hulu.com. Most shows are free, and a Hulu plus subscription allows you to download the next day after air showed for around $7.99 a month. We used that for years instead of paying for cable. You can often get Downton Abbey on the PBS website for free. If not you can watch on Amazon and if you have A. Prime you can get episodes for free. Try PBS for season II. Usually they can be watched on line from the PBS site. Especially since season III is starting. We have been rewatching DA on Masterpiece Theater on PBS. You might check it out there. I hear Season 3 will be out soon here. That is a good idea. I always run out of bobbin thread at an inconvenient time. I usually wind a couple of bobbins at a time. Mine for my Bernina 832 holds more than a regular bobbin but I still like to have the nest one ready, I need to try winding a whole spool just to see how far it will go! 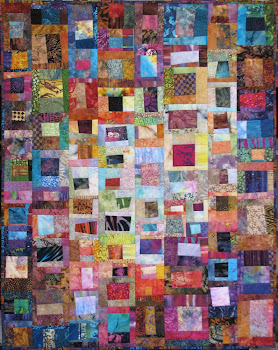 I have 18 tops that need to be quilted. I wish I had a long arm! I'm not very good at pre winding bobbins and then of course I get annoyed when it runs out. I think I like random lines and the square spiral. 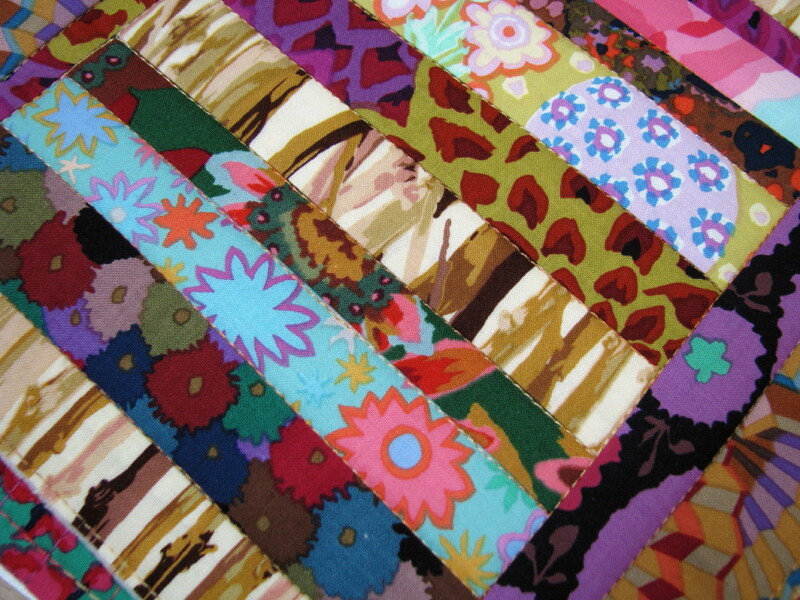 It's fun using scraps! 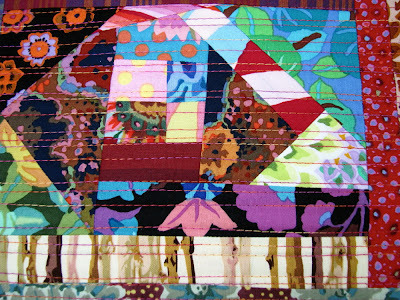 Love those lil mug rug quilts. And I didn't know we were to vote on our favorite. 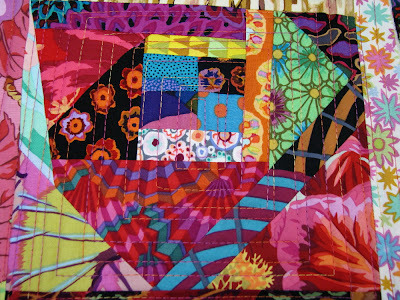 (*._,*) Each one is quilted perfectly for the design and fabrics. I 'boy sat' most of the day for my daughter. My 3 yr. old grandson tells me he is NOT a baby but a big boy ! Therefore I did not baby sit. Had much fun, but did not get any projects produced. i love the straight line random quilting. 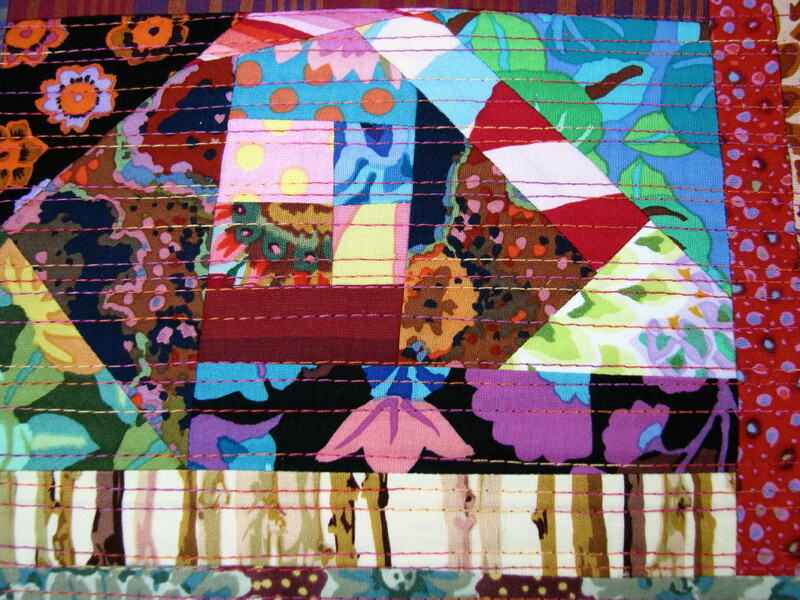 I put a quilt into a show once and the judges comments were...straight lines should be straight!! Whatever..
OK, I am guessing that was a new 500m or 547 yard spool of Mettler. I decided to wind a spool onto my bobbins just so see how many it would fill. I came up wit 10 and a half. Not sure that is 45% more per bobbin than you get! What size thread do you use for your bobbins? I try to keep 3-4 Gray thread bobbins on hand. Interesting to see how many you got from one spool. I've enjoyed looking at your Kaffe (and other)prints enough that I'm going to order a couple of fat quarter assortments from fabric.com. I will then be completely lost as to how I might want to rearrange my stash which is now mainly arranged by colors. Do you have any thoughts to share on that?